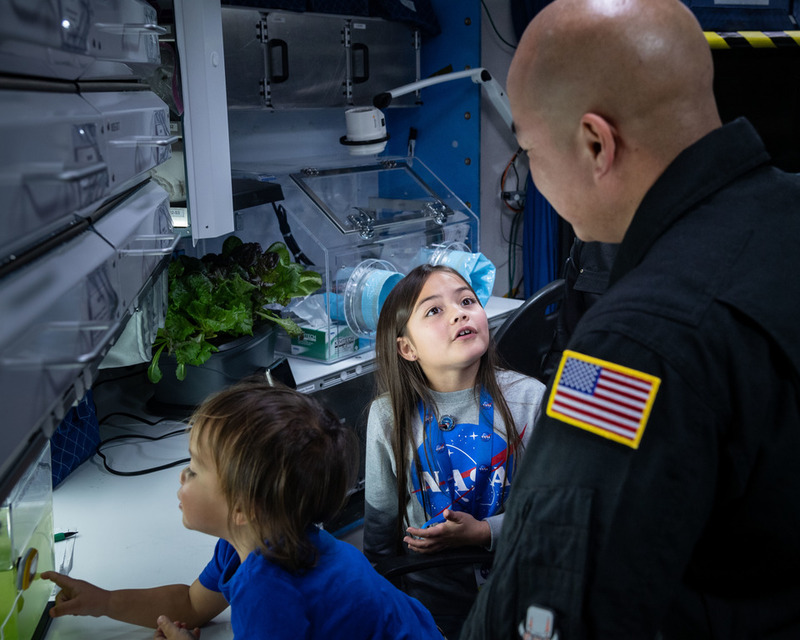 The Human Exploration Research Analog (HERA), located at NASA’s Johnson Space Center in Houston, is a simulated environment that produces physical and mental effects similar to those experienced in space. NASA’s Human Research Program to study the effects of isolation and confinement on the human body without leaving Earth. We sat down with the crew of HERA XVIII and a research scientist on the team to learn more about the mission. What was your background before getting involved with HERA? Rod Borgie, HERA Participant: I am active duty Navy dual designator (flight surgeon/naval aviator) and neuroradiologist currently serving as deputy force surgeon for Commander, Naval Air Forces. I am from San Diego and enjoy spending time with my wife, Suzie, and three kids Andrew, Emma and Jonathan. Sara Edwards, HERA Participant: I'm a nurse from the Chicago area. I also work at Fort Carson, Colorado, as an Army reservist. Ian Porter, HERA Participant: I am an active duty U.S. Navy board-certified aerospace medicine physician and flight surgeon. Originally, I am from Maryland, but now I currently reside in Pensacola, Florida, with my wife, Sarah Porter, and my two children, Gracie and Maximus. We love being in the Navy, and our family hobby is fishing currently (when in Rome …). Dustin Wallace, HERA Participant: I graduated in 2006 from the U.S. Merchant Marine Academy with a Bachelor of Science in marine engineering systems, a commission as ensign in the U.S. Navy Reserve and a 3rd assistant engineer merchant marine license. Since then, I maintain two careers as a Navy reservist and a merchant marine engineering officer, where I am a Lieutenant Commander and hold a chief engineer’s license, respectively. I am also a 2016 graduate from Embry-Riddle Aeronautical University, where I earned a Master of Science in aeronautics with a concentration in space studies. Peter Schneider, Experiment Support Scientist: I classify myself as a young guy still exploring my career and where it may take me. I earned both a bachelor’s degree in kinesiology and a master’s degree in biomedical sciences from Texas A&M University. After a year at the University of Texas MD Anderson Cancer Center working in breast cancer prevention, I took the opportunity to achieve a long-time dream of mine: to work at Johnson Space Center. I work as an experiment support scientist under International Space Station medical projects in Flight Analogs. I act as a liaison between our team and the Principal Investigator (PI) team. The goal is to integrate each of the PI’s science with HERA habitat operations, and then plan and implement data collection in the habitat. I also participate in the fun of developing some of the “simulated” experiments the crew does. Borgie: Most of us mentioned that we missed sunlight and seasons and the smell of outside air. However, I missed going to my kids’ ball games and activities the most. Although it can be very hectic, I am really looking forward to jumping back into their lives on my return home. Edwards: While we did get some phone conferences, I still missed simple and frequent communication with friends and family the most. Porter: My family first, for sure. I want to make sure I make that clear so I do not get in trouble (laughing here). I am a big sports fan, so I missed access to sports and fishing. I did overcome this some by posting up Washington Capitals Stanley Cup banners and Maryland Terrapin banners in my small piece of real estate. Wallace: I missed certain smells associated with the outside world, such as the scent of freshly cut grass, or the aroma enveloping restaurants as one traverses a vibrant city street. I also missed not having the freedom to go running or do my martial art, Capoeira. Schneider: The crew has to live, work and sleep in the same space. If I were them, I would miss going home to my family and pet dog the most. On the other hand, not having a long commute home after work does sound nice … The crew’s commute is only a 10-second climb up a ladder. What was the most challenging obstacle you overcame during the mission? Borgie: Early on, the challenge was getting the team to work efficiently across a multitude of tasks. The team got along great on a personal level, and we all had a common goal of maximum performance for a successful mission. We capitalized on each other’s strengths to plan out daily workload effectively. Edwards: I think our biggest obstacle was learning the simulation platforms used in the HERA program. We continued to improve throughout the mission. Porter: One task sticks out to me the most that stressed the crew, and it involved problem solving and communications with Earth-based teams to help find a water-mining site on Mars. Each time we had to deal with communications delays, I suggested we make a communications map to standardize the people we talk to. This helped us tremendously, and I believe we really overcame this obstacle early. Wallace: The most challenging obstacle, for me, was knowing that a camera is pointed towards me at virtually all times of the day, which required adjustment. This dynamic, in turn, allowed me to be more aware of myself. Schneider: Communication. I work as a liaison between Flight Analogs, the PI team and our ground support personnel (GSP). In troubleshooting hardware, for example, to perform a simple re-download of data, we first get a report from the crew about the issue. I then get a phone call from the Mission Control Center (MCC) about the issue and get in touch with the PI and my leadership to come to the perfect conclusion on resolving the issue. I then have to create a “space-like” response to pass back to the GSPs for them to relay back to the crew members. All of this can be stressed by the communication between MCC and crew being delayed by up to 10 minutes, depending on where they are in the mission. What did you learn most about yourself living in a confined space with other people? Borgie: Before starting our mission, I really wanted to remember astronaut Reid Wiseman’s thoughts regarding the importance of “expedition behavior;” as a team member, you should always help others and do what is needed at any time—despite how you might be feeling. I wasn’t sure how hard it would be to maintain that attitude during the course of the mission, but I found it takes minimal extra effort, especially when your crewmates exhibit similar behavior. The payoff was huge, and [it] really was critical to mission success. 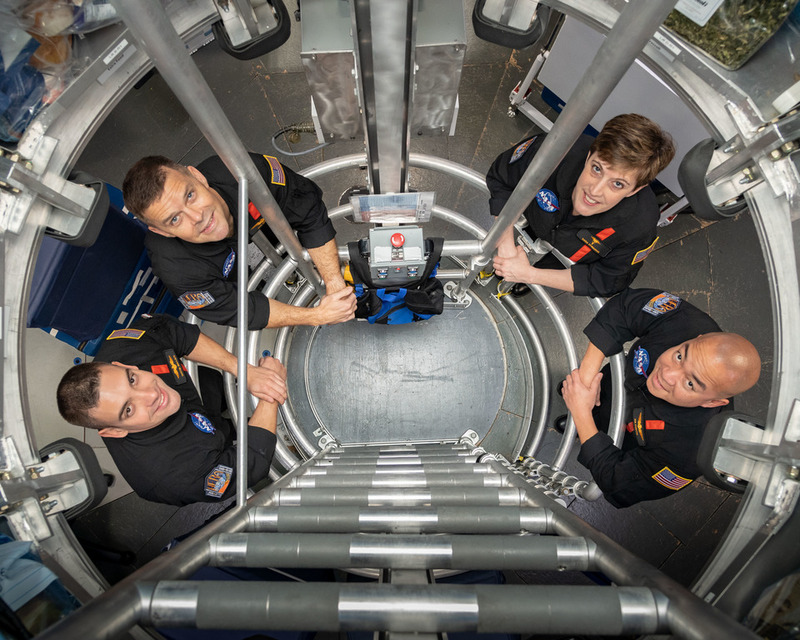 Edwards: Living in a confined space requires some adjustment, although the great crew members made that adjustment easier. I think the biggest adjustment was pre-planning how to handle activities that were all performed simultaneously in a small space. Wallace: Given my dual-career background, I was used to operating in relatively confined and isolated settings, between sea- and land-based environments. However, there remained a degree of uncertainty that I overcame during the mission. Schneider: I can only speculate what the crew learns about themselves when living in confined isolation for 45 days. If I put myself in their shoes, I imagine they quickly find out how important their personal space is to them. Personally, I learned that I really enjoy training the crew on their in-mission tasks and watching them follow through and do a great job. What did you enjoy working on most from a research perspective? Borgie: I really enjoyed the human behavior research and how we were given tools to enhance communication, explore team-building strategies and actively work conflict-management solutions. The experience was enjoyable, as I was fortunate to be part of a high-functioning crew. My crew members were an outstanding group, and I feel blessed to have shared time with them. I can honestly say I am a better person for having done this mission with them. Edwards: From a research perspective, I thought the life science was most enjoyable. We compared the growth rate of Triops shrimp, and we almost regarded those shrimp as pets by the end of the mission. Wallace: I enjoyed the flight analogs aspect of the study, which involved simulators. One simulator in particular required us to work as a team to perform space-borne operations. Schneider: I enjoyed working on the wearable technology. The concept of using biomedical data to discover which activities are favored or disliked by the crew is interesting to me. I think developing more unobtrusive ways of measuring this data is something that needs more focus, and I think HERA is a great platform for testing this class of devices. What was your biggest craving when the mission ended? Borgie: I really looked forward to non-dehydrated food and fresh salad. Interestingly, I did not miss social media, my cell phone or the internet. It was a very nice to disconnect from those devices and connect with my new surroundings; I enjoyed the break from those devices. 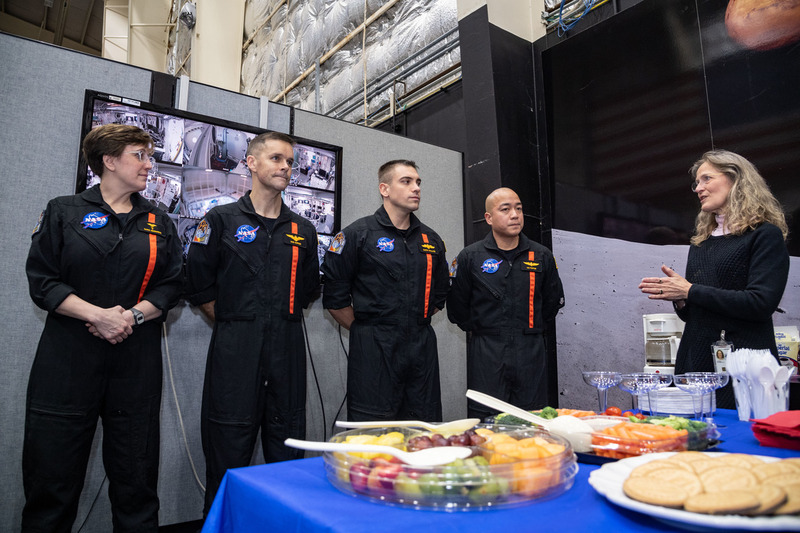 Edwards: I craved fresh veggies and fruits after the mission ended. Wallace: Being able to eat freshly prepared food, as well as reconnecting with family and friends. Schneider: In the past, the crews have gone straight to picking up a big juicy hamburger. This time they wanted to get some fresh food that wasn’t rehydrated. For me, I’m always craving tacos after a mission’s end—no idea why. Did you develop any new personality traits during the mission that you will continue to develop? Borgie: I did not necessarily develop “new” traits, but certainly learned the importance of some traits. Humor is great for stress mitigation and a powerful tool when used appropriately. To overcome my personal challenge of having a terrible poker face during our free-time card game, I purchased a set of Luchador (Mexican wrestler) masks that the crew wore during the game. It was a funny and strange sight, but also leveled the playing field for me since my happiness or disappointment with my cards was not as readily noticed. Edwards: I think a personality trait that might have been strengthened by my time in HERA is the use of humor in communication to alleviate stress and reduce emotional distance. Porter: I do not think I developed any new personality traits, but I do believe something I will try to implement in my life is just to listen better. I learned to listen in HERA, because I found that good communication begets success. I think I can apply this to family and work life back home. Wallace: This experienced allowed me become more aware of my surroundings and have a higher sense of self. The confined environment also permitted me to refine interpersonal skills with my fellow crew members. Schneider: Interestingly, we can only observe the crew members’ personalities through voice-coms and our mission log (a text-based interface between the crew and MCC) during the mission. We can actually sense when the crew is agitated, or if they are having fun. I enjoy seeing who becomes a comedian via text versus who is strictly business. On a personal level, I was able to really step up when it came to my leadership and coordination skills. I was tasked with coordinating an array of troubleshooting efforts, which required a good amount of correspondence with the PIs and Flight Analogs leadership. How has your experience helped inform future NASA missions? Borgie: It is my hope that our time in HERA will be valuable data for future habitat construction for long-distance space travel and colonization in terms of what are minimal requirements for privacy and other space concerns. I hope our personal data and traits will help inform future team selections to increase the likelihood for long-term success. Edwards: Our mission will help NASA identify potential factors as stressors and also determine that other factors do not induce stress; this will help with long-duration travel in the future. 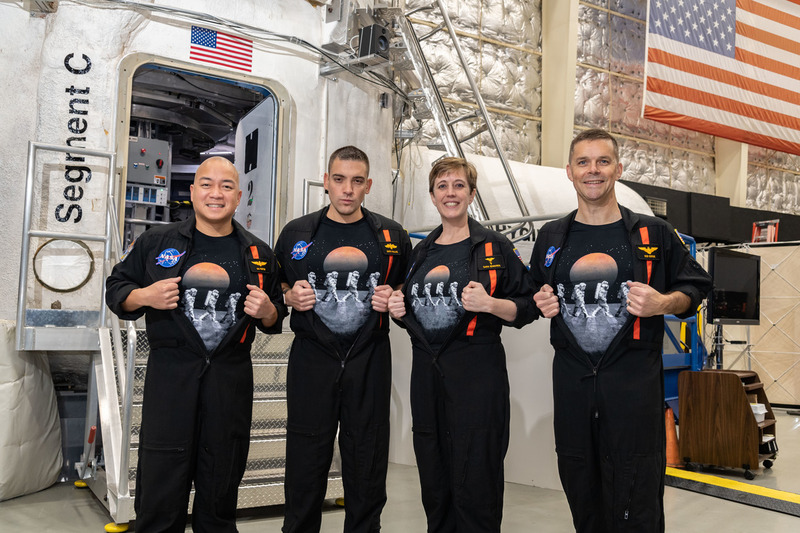 Porter: It is my hope that my time shared with the HERA 18 crew at NASA’s HERA habitat produces the high-quality data the researchers are looking for. I truly believe that this data can help answer questions we all have about long-term space missions. I think it will help get us there. I am so thankful and blessed to have a family and a Residency in Aerospace Medicine (RAM) Navy team that supported me and thought it was worth the precious time away from home. Wallace: We were able to provide a small part in laying the foundation to eventually conduct human spaceflight missions to the Moon and Mars. Schneider: Teamwork makes the dream work. Each crew’s unique problem-solving solutions to team challenges provides the PIs with more information on how optimize astronaut selection for long-duration space missions—specifically, Mars. Isolation, confinement and high fidelity are the hallmarks of the HERA analog. My role has been to preserve those traits while integrating new science, which can be a challenge. When we start going on long-haul exploration missions, I will know that my role had an impact on those astronauts.